Their leading goal scorer is out for the season and they're a few bad games away from being out of the Western Conference playoff picture. But right now, the Colorado Avalanche must feel like nothing can get them down. The Avalanche (36-26-6) look to win a sixth straight game for the first time in more than two years on Saturday when they host the Pacific Division-leading Dallas Stars. Colorado lost Marek Svatos, who leads the team with 26 goals, to a torn ACL last Saturday, an injury that will sideline the right wing for the rest of the season. But the Avalanche have won five consecutive games for the first time this season, and with a victory Saturday they'll post their longest winning streak since an eight-game run from Dec. 31, 2005-Jan. 17, 2006. Left wing Ryan Smyth also was injured in last Saturday's 5-2 win over Los Angeles, and will be out indefinitely for an Avalanche club which is seventh in the West but only two points ahead of the ninth spot. Colorado, though, also made a major addition this week, getting center Peter Forsberg back on the ice. The former MVP looked aggressive in his first two games since signing a one-year deal on Feb. 25, playing more than 40 minutes combined and setting up numerous scoring chances despite being held without a point. But without question, the reason for Colorado's strong play has been goaltender Jose Theodore, who has a 1.37 goals-against average in winning all five games during the streak. He got his second shutout of the season on Thursday, making 27 saves as the Avalanche beat Anaheim 1-0. Games against Dallas (41-24-5) have rarely gone well for Theodore, who's 1-8-1 with two ties and a 3.39 GAA in his career versus the Stars. He was pulled midway through the second period on Nov. 16 after giving up five goals in his only game against them this season, a 6-1 loss at Dallas. Center Paul Stastny, the team's leading scorer (20 goals, 35 assists), has looked good since returning from an appendectomy that cost him 15 games. He has three goals and three assists in his last seven contests. Stastny had a hat trick against Dallas in Colorado's 4-3 home win on Oct. 3. The Stars appeared to be making a push to catch Detroit as the top team in the West by winning 13 of 15 games from Jan. 29-Feb. 28. But they've dropped their past two - both on home ice - losing 3-1 to Nashville on Saturday and 2-1 to Phoenix on Wednesday. "The last two games have been frustrating," said captain Brenden Morrow, who was held without a point in both games and hasn't scored a goal in his last four. "We haven't had the intensity to win these hard hockey games." While Morrow has struggled lately, Mike Ribeiro has been outstanding. He has three goals and five assists in his last five games, and leads the Stars with 75 points. Teammate Brad Richards, acquired at the trade deadline, has not produced a point since posting five assists in his Dallas debut on Feb. 28 in a win over Chicago. 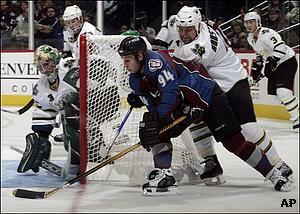 The Stars have won eight of their last nine meetings with the Avalanche.